Composed by Bob Good. 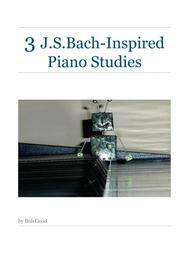 Contemporary Classical, Etudes and Exercises, Repertoire, General Instructional, Recital. Individual Part. 10 pages. Published by Surrey Dance Music (S0.458405). A collection of 3 Piano Studies inspired by J.S.Bach's works and techniques. "Airborne" uses Bach's Prelude in C Major BWV846 as its inspiration, but with the deliberate holding of the last note of each bar, and the placing of those notes, creates a most atmospheric piece. "Prelude" similarly has "pop-out" melody notes whilst "Ripplebach" plays one hand off against the other to create its atmosphere.